There are so many things a teacher can do with the CleverTouch Interactive Flat Screen but the most useful has to be making annotations with the annotation widget. This allows you to underline, highlight and annotate with ease. You can summon the widget anywhere on the screen by simply holding down your finger on it for a couple of seconds. Once it is summoned, you can write on any part of the screen and you can do it with your finger or a marker. You can annotate on any page of any programme and you can save the annotated page for further use. Also, you can clear the screen and write or draw on it from scratch. In the modern classroom, the teacher is a guide to learning. In addition to explaining and clarifying, the teacher sorts out what needs to be learned by highlighting and summarising. The interactive flat screen makes this process a whole lot easier as the information is instantly accessible and displayable and ready to be annotated and made transmittable. As a ‘knowledge worker’ the teacher has considerable power in our society. Teachers have the freedom to emphasise what needs to be learned. The interactive flat screen, through the annotation widget, guarantees that power for the generations to come. Watching how the teacher annotates on the interactive flat screen is also good preparation for the pupil. Underlining, highlighting and summarizing of pieces of text are techniques that are useful for third level education, where the student must deal with large amounts of knowledge directly, but also for many occupations in the Information Technology age. An interactive flat screen, like one from the CleverTouch range, gives the teacher more freedom and power over the material to be learned. His pupils share in this ease and power. Annotation, for both teacher and pupil, is a way of grasping and handling information. It is a kind of empowerment and self-assertion, an approach to learning that is as much about confidence and style as it is about understanding. Annotation is the essence of teaching and learning, especially at primary and secondary level. Not only is the teacher a guide he is a model to be emulated. As a knowledge worker he is an example of how to deal with knowledge when we encounter it. 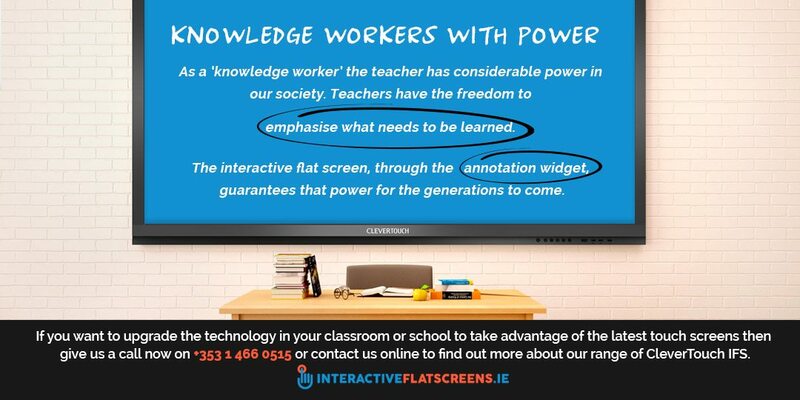 The advent of the interactive flat screen and, in particular, the annotation widget, will make the teacher’s role and the pupil’s role much easier as they will be, quite literally, on the same page and ready to annotate. You can view a training video on how to use annotations here. Blended learning is the future of education and the interactive flat screen is the ultimate tool for blended learning. It is a combination of the latest learning technology and the most traditional learning technology: the blackboard and chalk. The annotation widget facilitates the teacher’s role as guide at a time when guidance is most needed. The future of education looks bright as long as technology like this serves it. 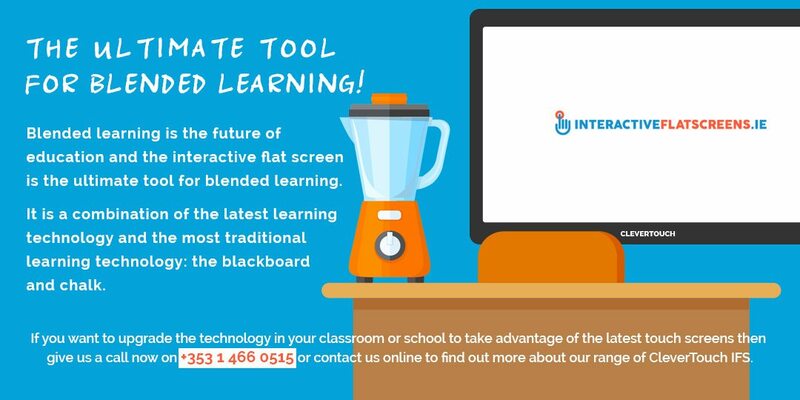 If you want to upgrade the technology in your classroom or school to take advantage of the latest touch screens then give us a call now on +353 1 466 0515 or contact us online to find out more about our range of CleverTouch IFS.